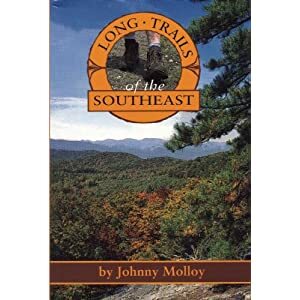 In this book you will find over 600 varied miles of long trails to hike, from the cypress swamps of South Florida to the high mountains of North Carolina. Each offers its own beauty and challenges. The shortest at 26 miles, the Wild Azalea Trail, is Louisiana’s longest footpath. It will surprise as it rambles over pine covered hills into lush bottomlands through which clear, sand-bottomed streams flow. The 41-mile Black Creek Trail of Mississippi runs along the course of the federally designated Wild and Scenic Black Creek. Three sections of the Florida Trail are included. The first 42-mile section traverses the Big Cypress National Preserve, where you will be introduced to “swamp slogging” while crossing sawgrass prairies broken by lush tree islands of palm, cypress and pine. There is simply no other hiking experience in the United States to match it. Farther north, a 60-mile parcel of the Florida Trail runs through the Ocala National Forest, where the world’s largest remaining tract of the unique sand pine scrub forest remains. The Apalachicola National Forest offers the 66-mile FT in a longleaf pine/wiregrass ecosystem divided by lush, junglesque forests growing along dark streams. Some may chuckle at such a notion, but after hiking the 104-mile Pinhoti, you will be singing this tune as well. And then there is the 85-mile Foothills Trail of South Carolina and North Carolina. This path will stun first time visitors. Georgia boasts two long trails, the Benton MacKaye Trail and the Bartram Trail. The 93-mile Benton MacKaye begins where the Appalachian Trail begins, Springer Mountain, and heads north along the western rim of the Appalachians. The Bartram Trail, at 110 miles, offers the longest continuous long trail trek. From Walhalla, South Carolina, drive north on South Carolina 28 north for 8.5 miles to SC 107. Turn right on SC 107 and follow it 2.5 miles to the state park, on your right. From here, follow the signs through the park to the Foothills Trail, on the road to cabins 7-13. From Walhalla, South Carolina, drive north on SC 28 for 8.5 miles to SC 107. Turn right on SC 107 and follow it for 8.9 miles to gravel Forest Road 708. Turn left on FR 708 and descend for 3 miles. Burrells Ford parking area will be on your left. The Foothills Trail crosses FR 708 just before reaching the parking area. This most southwesterly section of the Foothills Trail starts at one of South Carolina’s oldest state parks, a destination in its own right. Oconee State Park makes for a good jumping off point, whether you stay in the campground, with full amenities, or go upscale with one of their rental cabins. The Foothills Trail begins in piney woods near Stratton Mountain. Leave Station Mountain for Long Mountain, which offers views from its steep slopes, before dropping to the superlatively attractive Chattooga River. It is unusual to see rivers of this size being federally designated as wild and scenic in the East. However, the Foothills River doesn’t stay beside the river for long, as it climbs over a knob on a river bend. Make your way along Rock Gorge before resuming the river’s edge. At times the trail becomes so close that it is nearly in the river, as it passes through wooded flats and over small side streams with that everywhere-you-look beauty. Leave the Chattooga again in the vicinity of Round Top only to drop down to the river near Big Bend Falls, a surging force of water pinched between walls of the gorge. Beyond here, the trail stays fairly close to the Chattooga, until it enters the Kings Creek Valley. Here, a side trail leads a short piece to the “must see” Kings Creek Falls. Beyond Kings Creek the trail pulls away from the Chattooga to soon reach the Burrells Ford parking area. Burrells Ford is a walk-in camping area that used to have auto access until the Chattooga was designated as wild and scenic in 1974. This designation restricted auto access. Camping, fishing and wildlife viewing opportunities are numerous along the Chattooga. However, no camping is allowed outside of the campground at Oconee State Park. The section of the Sumter National Forest outside the Chattooga requires a free permit, which can be obtained by calling (864) 638-9568. Please call two weeks in advance. In truth, there is no good camping until 8 miles in, near Sumter’s Lick Log Creek. The white-blazed Foothills Trail starts inauspiciously near the Oconee State Park cabins. Make sure and register at the self-registration board near the parking area. Begin the trail across the road from the parking area and enter pine-oak woods. The Hidden Falls Trail runs in conjunction with the Foothills Trail. Reach a junction at .4 mile. The Tamassee Knob Trail leads right 1.6 miles to Tamassee Knob. Veer left here and work around the headwaters of Horse Bone Branch to make the south end of Long Mountain. Leave the state park and enter the Sumter National Forest at mile 1.2, then intersect a closed road. Keep forward here as the Hidden Falls Trail leaves right. At mile 2.0, a side trail leaves left for the Long Mountain fire tower. The tower is closed to the public but the peak does offer wintertime views. Beyond this, other views open to the east before the Foothills Trail dips over to the west side of Long Mountain and works its way down toward Clear Branch, then over a couple of wooden bridges down the narrow upper reaches of Tamassee Creek. Head away from the creek up a steep hollow. Once out of the hollow, views open to the southeast. The trail reaches SC 107 at mile 4.6. Do not cross the road, rather, stay right and immediately reenter the woods, heading up a timber road. Soon veer off the timber road in piney woods and work around the east slope of Dodge Mountain. Views open through the trees to your right. Bisect an old logging road at mile 5.5, then turn left away from the ridgeline, reaching gravel Cheohee Road at mile 5.9. Cross the road at an angle, soon reaching SC 107 at mile 6.0. Cross SC 107, and circle around the south end of Chattooga Ridge, picking up a streamlet feeding Lick Log Creek in woods of tall white pine. Turn north, paralleling Lick Log Creek below. Span a bridge at mile 6.8 and reach a junction. A side trail leads left 200 yards to the Thrift Lake parking area. Span another small branch before reaching the Nicholson Ford parking area at mile 7.5. Keep descending, now along noisy Pigpen Branch, to reach a camping spot in a grove of white pine at mile 8.0. Immediately span Lick Log Creek on a footbridge and pass more camping areas to span Lick Log Creek again. Make a short but steep descent to reach an important trail junction at mile 8.3. You have now entered the Chattooga Wild and Scenic River corridor. This boundary is marked with light blue blazes. Here, the yellow-blazed Bartram Trail (This part of the Bartram Trail is no longer recognized by Sumter National Forest), running in conjunction with the dark blue-blazed Chattooga Trail, leads left to cross Lick Log Creek just below Lick Log Falls a short distance away. The Bartram/Chattooga Trail then heads downstream on the Chattooga River. The Foothills Trail, also now running in conjunction with the Chattooga Trail, leads right, along the edge the Chattooga River Gorge on a rocky rooty path alongside rock bluffs, ranging far above the audible Chattooga. Top out at mile 8.7. Trace an old woods road through hickories and oaks, cutting over a knob that the river works around. Pass huge hemlock trees as you descend to make the Chattooga at mile 10.1. The wild and scenic river froths and crashes over rocks, then gathers in pools, building steam, before continuing its tortured journey downstream. A streamside flat has campsites, especially near Simms Field, a formerly settled area and historically used campsite. A riverside beach and large swimming hole marks Simms Field, which is reach just after a footbridge at mile 10.9. The trail stays along the river, so close that at times the path may be under water when the water is up. Reach another beach across from a rock bluff at mile 11.3. The trail soon leaves the river and works around Round Knob on a steep mountainside before intersecting the side trail to Big Bend Falls at mile 12.8. This rough, unmarked side path dips below a rockhouse to reach the upper part of the huge crashing falls. Switchback away from the river before descending past Fraser magnolias and rock formations to once again near the river at mile 13.1. Short side trails lead to the water. The Foothills Trail crosses an eroded roadbed at an angle and passes a small falls of a feeder branch just before reaching a trail junction at mile 13.6. Here, the Big Bend Trail leads right 2.7 miles to Cherry Hill campground. The Foothills/Chattooga Trail bridges a small branch above a 6-foot cascade. Drop alongside the Chattooga River, rock hopping upstream at the water’s edge. Look around and grasp the absolute beauty of this river. A rough, high water route circumvents this section. Keep upstream and make a flat with camping possibilities on a riverbend at mile 14.4. Switchback up the side of the gorge in heavy rhododendron among rock outcrops, then turn into the King Creek watershed, picking up an old wagon road to reach a trail junction at mile 15.3. The Foothills Trail veers uphill to the right, and the Chattooga Trail keeps forward to reach Burrells Ford Walk-in Campground. Keep with the white blazes to reach another junction at mile 15.7. A spur trail leaves right .2 mile to King Creek Falls. Don’t bypass this 80-foot drop into a clear pool. The Foothills Trail heads downstream to span Kings Creek, then climbs away from the stream to meet Burrells Ford Road, Forest Road 807, at mile16.4. Just before the road, a spur trail leads forward to make the Burrells Ford parking area. The Foothills Trail turns right to cross FR 807 and head for Medlin Mountain.